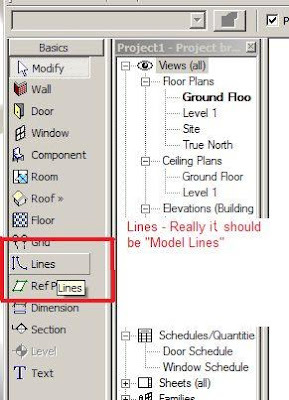 Revit Fix: “Lines” – Oh wait; they are actually model lines. “Lines” – Oh wait; they are actually model lines. I had the pleasure this week of spending some time in our Sydney office, assisting them in the implementation of Revit. It was always great to hear other people’s view, as it gives you other perspectives and experience. The “Lines” command came up as there was some confusion, which was 100% understandable. It has to be admitted that Autodesk really need to review some of their naming terminology in Revit. The above “Lines” command is definitely one. 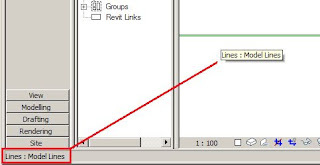 In the Basic design bar when newer users see “Lines” they don’t know what type of line it is? Well it’s a model line, and really Autodesk should change the name Lines to Model Lines here to avoid confusion. After all when you select the line, it is called a “model line” in the status bar. My other pet peeve is, can they make up their mind if Detail Components are called components or items? In the design bar they are called components and in the family browser they are called items. It’s not that difficult really!